Detroit Speed Rear Coilover Conversion Kit for the 2016-2019 Camaro SS is a direct bolt-on assembly that completely replaces the OEM rear strut assembly. This kit includes helper springs and spring dividers if you choose to run a low ride height along with all necessary hardware. The kit uses a DSE/JRi all aluminum shock with "Detroit Tuned" valving. 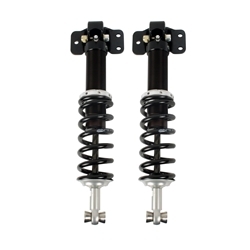 The kit allows ride height adjustment and easy rear spring changes. Note: Detroit Speed recommends using the magnetic ride control shock simulator kit from X-ineering Electronics.